Mixed cryoglobulinemia syndrome (MC) is a systemic vasculitis characterized by multiple organ involvement due to the vascular deposition of immune complexes, mainly the cryoglobulins. B-lymphocyte expansion represents the underlying pathological alteration frequently triggered by hepatitis C virus (HCV) infection. Purpura and skin ulcerations, especially of the lower extremities, are the most frequent cutaneous manifestations representing one of the hallmarks of the disease. Ulcers appear torpid and deep and are associated with high levels of pain, inflammation, and tissue necrosis. 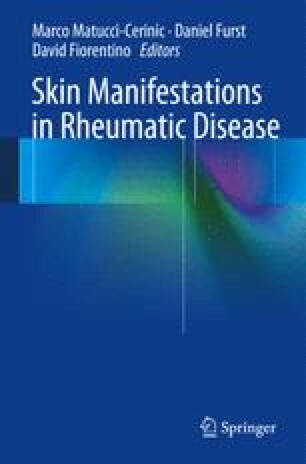 In this chapter the definition, differential diagnosis, and histological features of skin manifestations in MC will be provided.